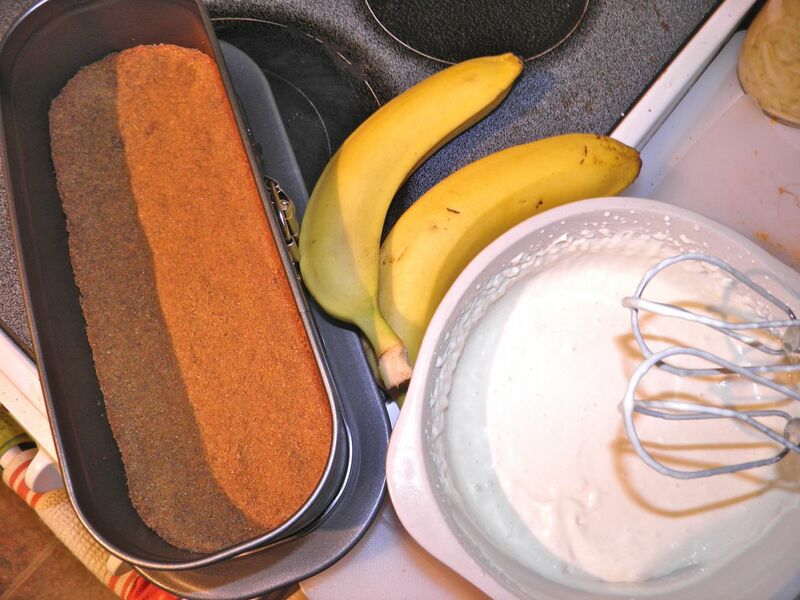 No bake banana split cheesecake, but it does benefit greatly from being frozen. Some things just have to be attempted in life. Some are fundamental, some not so much. You be the judge of where on the scale to place this recipe. Most of what goes into this interesting cheesecake. Missing? Strawberry and chocolate sauces, nuts and whipped cream. The thing about that cake (it was a cake, not cheesecake) was that it didn’t sound very much like a banana split. Not unless you call banana cake with ice cream and sauce a variation on a banana split. Yes, but…no. I figured that with some thought one could do better. To fully transform an original into a different form you have to apply some creative thinking. So I kept the bananas and ditched the ice cream. 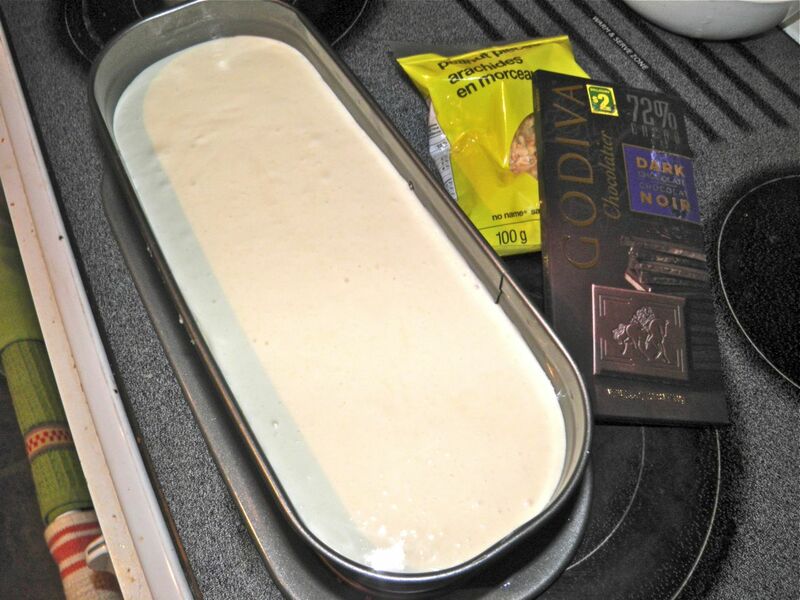 Now wait…an obvious substitute (lots of milk product) would be cream cheese. Hence this turned into a cheesecake. Since banana splits don’t have baked bananas, it had to be no-bake. This recipe is fundamentally a “Borden’s Cherry-O Cheesecake” with alterations – the best no-bake cheesecake around. From there all you really have to do is make the sensical substitutions, assemble, and make your own strawberry sauce (why not?). Yes, there's a few "recipes" but nothing too involved. I sometimes make cheesecake for holiday dinners with the family. They don’t know yet that this year’s will be a banana split! 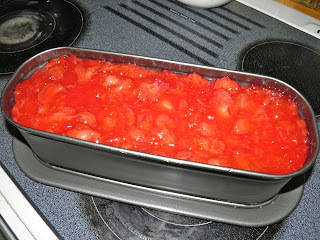 I imagine this would be a great unusual party dessert for all of the summer months too. Amaze your friends and befuddle your enemies. Pull this cheesecake out of the refrigerator for this – or any – holiday. Arrange the bananas two-deep on the crust. Pour the cheesecake filling over the bananas, covering completely. Beat the softened cream cheese with the sweetened condensed milk, lemon and vanilla until smooth. 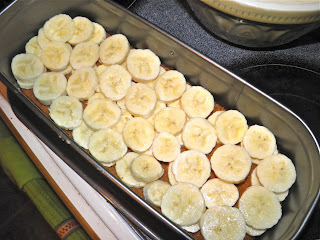 Slice the bananas fairly thinly and arrange two slices deep on the cooled graham crust. Pour the cream cheese filling over the top and tap the dish on the countertop a few times to ensure the filling gets in around all the banana slices. The idea is to seal the bananss from the air to prevent browning. Refrigerate for a minimum of two hours before proceeding. Clean the strawberries and slice. Place in a pot with the sugar, water and salt. Bring to a boil and add the cornstarch. Mix vigorously and cook for 2 minutes stirring constantly. Cool before pouring onto the cheesecake. After the cheesecake and strawberry sauce are both cool, pour the strawberries evenly over the top of the cake. 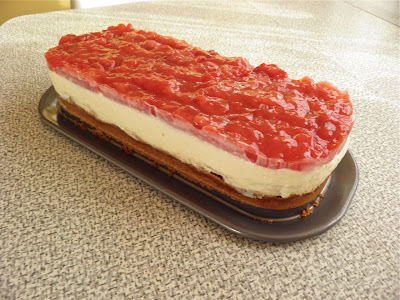 Place the assembled cheesecake in the freezer. Let it thaw slightly at room temperature about 1/2 to 1 hour before serving. 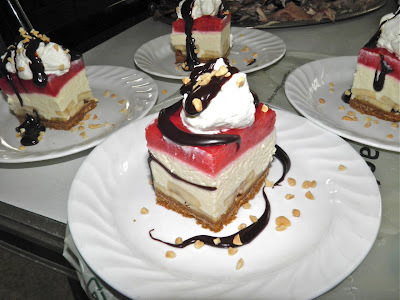 To serve, remove the ring from the cheesecake and place on a plate. Slice the cheesecake, and top with chocolate sauce, whipped cream and peanuts. And there you have it – a banana spit in cheesecake form! a 100% knock-it-out-of-the-park hit with my family. Oooh, what a creative and delicious idea!